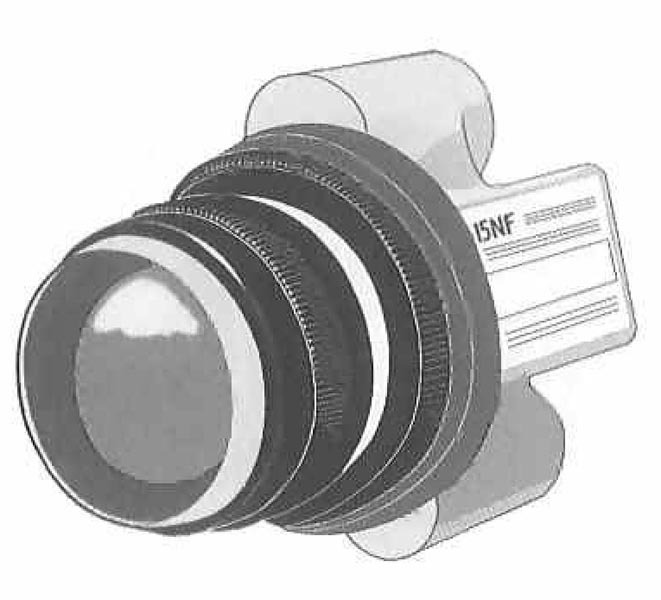 Type NF indicators provide a 2 color visual indication of the presence of air pressure in a system. Indicator color choices are available as noted in the catalog number selection chart. The NF provides for two modes of operation. By moving an adjustment clip, the indicator will operate with a spring return for pressure/no pressure indication, or with the use of a second port will remain in its switched position until a second pressure signal is applied returning the indicator to its original position. Units are designed for oil tight panel mounting. Lenses and ball indicator design extend beyond panel surface to provide visual indication of position without standing directly in front of indicator. 45 to 150 psi (Spring Mode) 1/8 NPT ports 2 5/8 in. 1 1/2 in. 2 1/8 in.